STRAWBERRY BANANA CHEESECAKE SALAD — Fresh strawberries, sliced bananas and marshmallows are folded into a mixture of whipped cream, vanilla yogurt and pudding in this crowd-pleasing fruit salad. Sometimes, I get a craving for what I like to call a “potluck salad.” You know, the kind that’s loaded with whipped cream, pudding and marshmallows, like this Strawberry Banana Cheesecake Salad. My husband and kids would eat this kind of thing at every meal. And this is one of our all-time favorites! 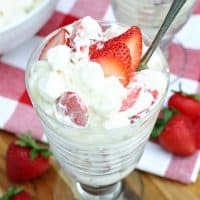 Fresh strawberries and bananas are folded into a mixture of whipped cream and pudding, and then a handful of miniature marshmallows are tossed in to make it even more irresistible. If you can’t find the cheesecake pudding, you can substitute vanilla or white chocolate. It will still be delicious! This is the kind of salad my mom used to make way back in the 1970’s. But it’s the kind of thing that everyone loves, so it never seems to go out of style. Well, unless you’re trying to eat healthy. But I have a delicious kale salad for that! This creamy fruit salad will definitely go quickly at any potluck or get-together. Which is good, because it tends to get a bit runny when it sits overnight, so you don’t want any leftovers. Just be sure not to add the fruit and marshmallows until just before serving! Be sure to save this Strawberry Banana Cheesecake Salad recipe to your favorite Pinterest board for later. 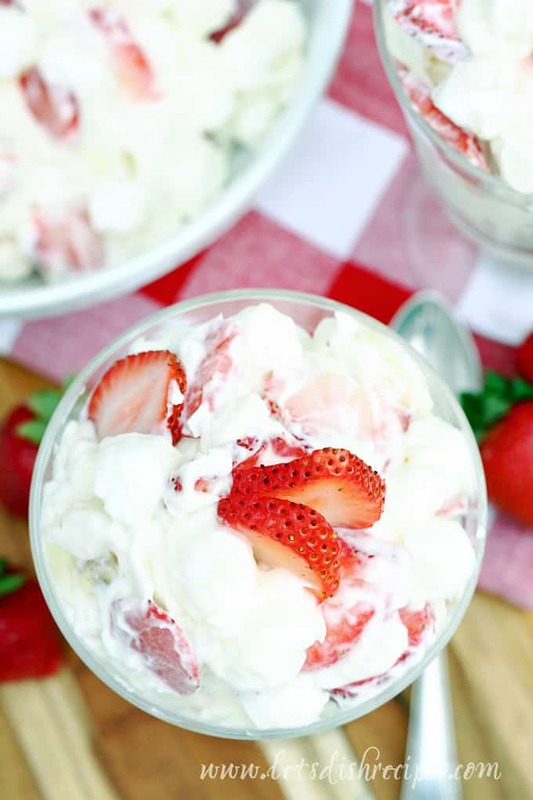 Fresh strawberries, sliced bananas and marshmallows are folded into a mixture of whipped cream, vanilla yogurt and pudding in this crowd-pleasing fruit salad. With an electric mixer, beat cream and sugar until stiff peaks form. In a large bowl, whisk together yogurt and pudding mix until smooth. Fold in whipped cream. Refrigerate until just before serving. 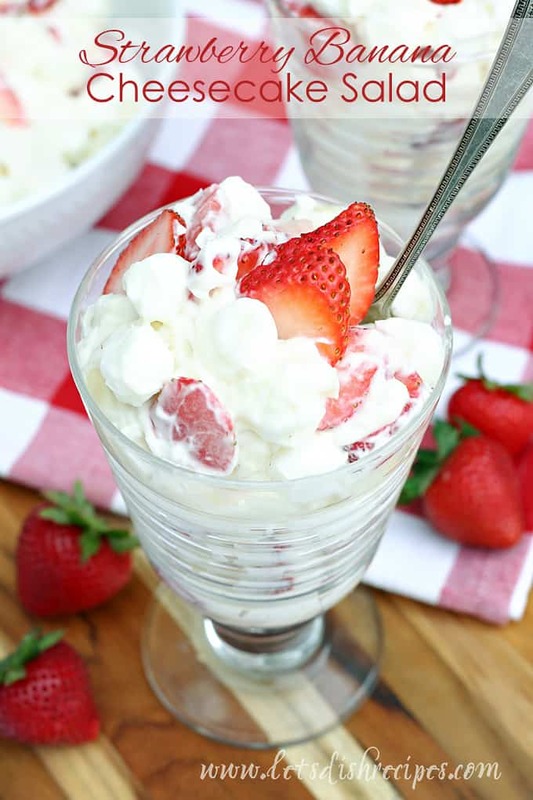 Remove whipped cream/pudding mixture from refrigerator and gently fold in strawberries, bananas and marshmallows. Serve immediately. Yummy! I think I’m starting to love “potluck salad” too. This is just so creamy and fruity! Every scoop must taste like heaven. Good recipe!